The Ohio River had always been prone to flooding. Just 10 months before, the Ohio had hit record levels at Wheeling. The Ohio River had always been prone to flooding. Just 10 months before, the Ohio had hit record levels at Wheeling. However, nobody living between Huntington and Parkersburg had ever seen anything like the 1937 flood, which was brought on by melting snow and 19 straight days of rain. It devastated communities along the entire 1000-mile stretch of the Ohio. A million people were driven from their homes between Pittsburgh, Pennsylvania, and Cairo, Illinois. Just in West Virginia alone, the flood claimed nearly 400 lives and caused a half-billion dollars in damages. The disaster changed how the federal government manages rivers. In the years following the flood, the U.S. Army Corps of Engineers built flood-control lakes and reservoirs and dozens of flood walls, including ones at Huntington and Parkersburg. 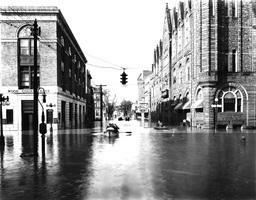 The 1937 flood remains the worst disaster ever to hit the Ohio River Valley and the highest flood ever recorded in Huntington and Parkersburg. A million people were driven from their homes between Pittsburgh, Pennsylvania, and Cairo, Illinois.